As it is “Operation Local Search Marketing” month, this month here at Rocktime, thought to share with you how much we love, Google AdWords' move to add location extensions to the PPC account adverts. Great example of Fitness First using this service above (see image or Google search Fitness First). Basic summary is, you link your Google Places Adverts to your AdWords campaign. This is another reason why we have been raving recently/couple of years to our clients to get everything in one Google account. 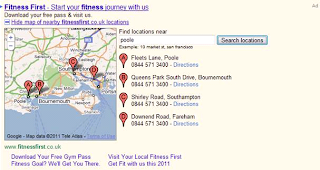 Google AdWords location extensions are a local ad format designed to help local customers find your local business. Watch this video to find out how to transition your local business ads to location extensions in five steps. Alternatively contact the Flashlight Search Marketing Team to arrange this for you. If your Google AdWords campaign is focused on local business and you have more than one place of operation (Pizza Hut is an example given on above video), then you really may want to consider using local ads, enriched with additional information, such as address and phone number. A big bonus is that with this feature you will be able to target multiple locations within the same campaign. Google will show a local extension in the ad as default – this will be based on the users query ie: Pizza Delivery London and the users IP. We believe that this is a perfect strategy for local targeting within AdWords and are implementing this for a number of clients with more than one local location. Let us know what you think and send us a comment below! Read more about setting up your Google AdWords over at the Local Extensions Best Practice Guide from Google. Google get their Swag on!